ERASE/REPLACE: a review of "Alien: Covenant"
As I ponder this fact, it is indeed more than a little strange to me to think that we are now just a hair up to 40 years since Ridley Scott's "Alien" (1979) was unleashed into the world. Honestly, and despite its unquestionable influence upon the science-fiction film genre, especially from the groundbreaking special effects as well as the set, production and of course, H.R. Giger's iconic creature design aspect, the original film is really not much more than a creature feature depicting an especially lethal haunted house in space. But yes, it is one that was brilliantly realized by Ridley Scott as he created an evocative and merciless future vision that only continues to inspire, enthrall and terrify. As one who tends to give horror films a wide berth, even I could not escape Scott's grasp all of those years ago as "Alien" was a film I would visit and re-visit often, marveling at the cast of seven and anchored by the ever resilient Sigourney Weaver as Ripley, who all addressed each other by last names while existing upon this immense yet junky space freighter, each adorned with boiler suits, baseball caps and gym shoes. To my pre-teen spirit, it was a fantasy world to get lost inside of for certain, just as much as George Lucas' "Star Wars" (1977), but one that felt so oddly tangible due to the gravity of the human beings who would soon be slaughtered one by one by the chest bursting, acid dripping behemoth. Ridley Scott's conception felt to be so complete and self-contained than any extension of that particular universe felt to be impossible. And yet, Writer/Director James Cameron achieved just that and then some with his superior, relentless and equally groundbreaking sequel "Aliens" (1986). For my money, and despite Director David Fincher's best intentions with "Alien 3" (1992), I fell out of favor with the series as inspiration and invention turned strictly to commerce. I was only attracted back to the fold with Ridley Scott's grand return with "Prometheus" (2012), the beginning of his prequel installments to his original film. For some, "Prometheus" was a grand disappointment, mostly due to the lack of...well..aliens doing what they do so ruthlessly. For me, I really did love that film (despite some flaws--why are Scientists so stupid?) as Scott actually seemed to be having fun behind the camera again after helming one beautifully filmed but dourly presented feature after another. Even for a film that honestly does not necessitate a prequel, I had to give it to Ridley Scott and his writers for devising a history, an origin story, and something that straddled the barriers between the cerebral and fervently nihilistic as the film set to try and delve into nothing less than the beginnings of our existence. And still, it made time for a spectacularly gonzo sequence of one character self-administering a C-section/abortion while imprisoned inside of a cryo-tube. With the prequel/sequel, Ridley Scott's "Alien: Covenant" has its human cake and violently eats it too as we are indeed given quite a substantial bang for our buck. Certainly those who were disappointed with "Prometheus" will be more than satisfied with this new installment as the xenomorph and their endlessly ravenous brethren are frighteningly center stage. Yet, even so, I was more than pleased to see Scott, not only continuing to be re-inspired and re-invigorated, he is also steadfast in his desire to keep unearthing the meaning of it all...albeit one chest-burster at a time. Opening in the year 2104, 10 years after the events in "Prometheus" and 10 years before the events in the original film, Ridley Scott's "Alien: Covenant" finds the film's titular colonization spaceship-- containing 15 crew members, 2000 colonists, 1000 embryos and overseen by the ship's synthetic crewman named Walter (Michael Fassbender)--en route to the remote planet Origae-6. When a sudden electrical burst occurs, damaging the Covenant and killing some of the colonists as well as the ship's captain (James Franco in a blink-and-you'll-miss-it cameo), Walter awakens the crew from hypersleep in order to make crucial repairs. Once the repairs have been made, the crew receives a mysterious transmission from a nearby, yet unknown planet that readings indicate is somehow habitable for humans. The newly ranked captain, Christopher Oram (Billy Crudup), a man of faith who feels it is the Covenant's destiny to fulfill their mission of colonization, orders a full investigation of this planet despite the protests of Daniels (Katherine Waterston), the wife of the ship's original captain, who wisely and ominously feels that "if it's too good to be true, it probably is." A portion of the Covenant crew heads down to the planet where they inadvertently trigger and are indeed encountered by an eco-system ready to reproduce the horrific beasts and waiting to slash them apart. 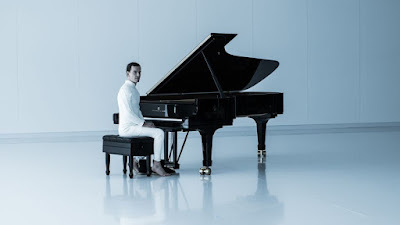 Yet, more unexpectedly is the presence of David (also played by Michael Fassbender), the synthetic from "Prometheus" who was last seen travelling the universe with Dr. Elizabeth Shaw (Noomi Rapace) in search of the source of their respective creators. As crew members continue to find themselves slaughtered and the true intentions of David rise to the fore, it is up to Daniels on the planet's surface in tandem with Tennessee (a surprisingly strong Danny McBride), the Covenant's chief pilot to make their great escape. Ridley Scott's "Alien: Covenant" is a masterfully mounted installment that seems to cherry pick the best elements of this long running series and has merged them to greatly sinister,often thrilling and gruesome effect. Working with his strong cast and his first rate team of collaborators, most notably Dariusz Wolski's crystalline cinematography and Composer Jed Kurzel's urgent score, Ridley Scott has taken the close quarters horrors and body terrors of his original film, the brutal nihilism of "Prometheus" and the war film pyrotechnics of Cameron's "Aliens" to fuel an experience that again surprised me with its inventiveness, and full throttle bombast, excitement, and dire intensity. To think, and much like the 72 year old George Miller, who emerged with the extraordinary "Mad Max: Fury Road" (2015), Ridley Scott, who will turn 80 years old this November (! ), is also showing no signs whatsoever of slowing down or going away quietly. In many ways, with"Alien: Covenant," it feels like a film that allows Scott to rage violently against mortality itself. Perhaps that is the core of the "Alien" series as a whole, especially with what Scott seems to be working towards or through with his prequel series. Clearly, the films feel formed from the mind of a passionate atheist as he has devised of a film universe where the nature of God or some sort of supreme entity is as challenged as much as it is sought, the nature of creation itself seemingly born out of some malevolent sense of power and unspeakable cruelty. "Alien: Covenant" delves further into the mind (such as it is) and motivations of the synthetic David, who even from "Prometheus" was more than a little creepy and not at all a genteel seeker of human understanding and consciousness. He was always one to have an ace up his synthetic sleeves and in "Alien: Covenant," he becomes a truly vengeful force and completely instrumental in the continued evolution of the series' titular monsters. And still, at his and the film's core, sits the theme of creation as we learn in Scott's purely Kubrick-ian prologue sequence that David named himself, carries a predilection towards the music of Wagner and already views his creator Peter Weyland (Guy Pearce) as inferior as Weyland will one day die while David could essentially live forever. Once David is confronted with the ore sympathetic Walter, David seethes, "When you dream, do you dream of me?" --certainly an echo as well as conceptual link to the replicants in Scott's "Blade Runner" (1982) and his upcoming "Blade Runner: 2049" as directed by Denis Villeneuve. Furthermore and with a disturbing insidiousness, David utilizes whatever compassionate and inquisitive nature of humans completely against them (a tactic that makes those Scientist's stupid decision feel more plausible and even inadvertent at times), ultimately, creating a schematic in which, I think Ridley Scott himself is arguing: human beings are the sole engineers of their own destruction. Even so, "Alien: Covenant" finds Ridley Scott wrestling through the primary and primal themes of every film in the series as it is a study of humanity and survival within an inhumane and unforgiving universe. The fight for survival and the right to exist is the connective tissue that links David, the human characters and the aliens together in a ferocious Darwinian battle of the fittest and displayed spectacularly during the film's climactic battle between all three beings, in which there is one winner by film's end but a war that will rage onwards in the overall storyline as well as in what I am feeling will be potential future films (stay healthy Ridley). These are the qualities that separate "Alien: Covenant" from other creature features like say, the increasingly lucrative yet brain dead "Jurassic Park" series, where there really is nothing in its head other than finding new ways for stupid people to do stupid things in order to find themselves eaten. In those films, it if as if none of the characters of subsequent installments have heard of anything that had occurred in the previous films, making the experience overall so meaningless. Yet, in the "Alien" series, none of the characters have even really heard of anyone else from different installments, thus making each film a singular event of such terror, while building a larger conceptual arc of nihilistic fury. Ridley Scott's "Alien: Covenant" finds a legendary filmmaker returning once again to where it all began for him, and miraculously mining new territory while also providing more than our fair share of the familiar elements of face huggers and chest bursters. This was propulsive, provoking, punishing entertainment, demonstrating that sequels need not be money chasing time wasters but ones that can inspire feverish excitement and dread all over again. FAMILY FEUD: a review of "Guardians Of The Galaxy Vol. 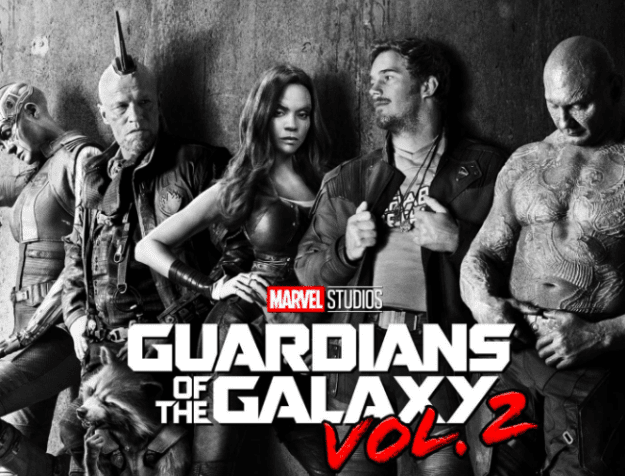 2"
If you have been regular readers of this blog, then you will know very well that I was not a fan of Writer/Director James Gunn's "Guardians Of the Galaxy" (2014). While not a bad film in the least, it was one that wholly underwhelmed me as I just didn't find it to be nearly as clever or as audacious as audiences, critics and even the film found itself to be. 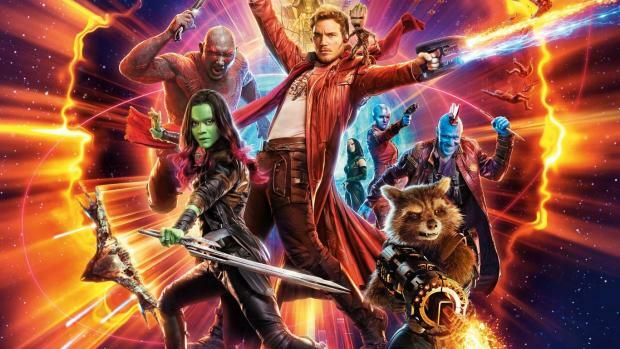 For me, from its characters, story to even the 1970's era songs contained within the film, Gunn's vision was more than a little pedestrian when I felt that it should have taken considerable risks with the Marvel formula while also expanding upon its own cinematic universe. And now, we arrive at James Gunn's "Guardians Of The Galaxy Vol. 2," the second chapter in his space rock opera and the fifteenth film in the Marvel Comics series overall. While Gunn does indeed expand upon his universe with a new legion of colorful characters (literally) as well as a broader emotional palate, and the film does have a few dazzling moments here and there, the final result was one that continued to underwhelm me due to its own tentativeness to really break free of its own conventional trappings. As with the first film, "Guardians Of The Galaxy Vol. 2" is not a bad film whatsoever. But when you think of what it could have been, the film as it is indeed another disappointment. "Guardians Of The Galaxy Vol. 2" opens with our titular interstellar team of miscreants, now famous for their collective derring do, ensconced in battle with an enormous tentacled monster at the request of the Sovereign race who are in need of having their sacred batteries protected. While the wise-cracking half Earthling Peter Quill a.k.a. Starlord (Chris Pratt), the petulant warrior Gamora (Zoe Saldana), the deadpan, muscular Drax (a terrific Dave Bautista), the rapacious, weapons obsessed Rocket Racoon (voiced by Bradley Cooper) and now Baby Groot (voiced by Vin Diesel) continue to bicker, fight and insult each other, the group has unquestionably formulated itself into a quasi family devoted towards each other and their union. Trouble occurs after the film's opening battle, when the team is awarded Gamora's estranged, enraged sister Nebula (Karen Gillan), captured after attempting to steal some of the Sovereign's batteries. Yet, upon their departure, Rocket steals some batteries, leading the Sovereign to send a squadron of attack drones in pursuit of the Guardians. An intense space chase and dogfight ensues and becoming quite perilous until our anti-heroes are rescued by a mysterious figure, thus forcing the team to crash land on a nearby planet and the Sovereign to enlist the aid of Yordu (Michael Rooker) and his space pirates The Ravagers to hunt down and re-capture the Guardians. As the Guardians regain their bearings, they discover that they have been saved by Ego (Kurt Russell), an immortal consciousness being known as a Celestial but who has voyaged the universe through a human avatar...an especially lonely human avatar who in the year 1980 explored planet Earth, fell in love with and impregnated Peter Quill's Mother, therefore making this interstellar entity Quill's Father! Yet, what we end up with is no simple family reunion, as Ego's duplicitous nature becomes apparent, ultimately threatening the fate of the universe once again unless the Guardians can pull themselves together to save it one more time. James Gunn's "Guardians Of The Galaxy Vol. 2," while a worthy successor to the first film in continuity and spirit, I just wished that it had a greater impact for me as the end result is essentially an overlong sound and light show starring a collective of space cowboys and space pirates and truthfully, none of them are really all that interesting as characters in the first place. Yes, Gunn has helmed a sleek looking film, with top of the line special effects, precisely what we are now accustomed to seeing and expecting. Yet, as with so many films these days, we are in an age where the special effects simply are not terribly special anymore. Or for that matter, they almost feel as if they are effects made by computers for computers--effects that don't seem to have that human ingenuity behind them. What "Guardians Of The Galaxy Vol. 2" delivers is just the same old-same old bombastic CGI overkill that feels more animated than actually directed. Then, there is the soundtrack, a key point of enjoyment for fans of the first film and one of disappointment for me. Again, James Gunn's song picks felt to be more studio driven and fully felt, songs from the 1970's that are easily recognizable and therefore, comfortable, rather than making the experience truly unique. Within "Guardians Of The Galaxy Vol. 2," Gunn utilizes the same tactic to an unimaginative degree. Honestly, do we really need another movie, let alone this one, where we hear Electric Light Orchestra's "Mr. Blue Sky" again? Why not "Fire On High"? Why not have a space battle set to Yes or Frank Zappa or Parliament? Just the same old songs that we all know and love as comfortable as your favorite warm blanket in a film that is supposed to be more of an untamed, wild ride. Even so, with the music that was chosen for Peter Quill's "Awesome Mixtape," Gunn relies more heavily upon a certain soft rock aesthetic that did carry ore of a charm this time around and did lend itself to some lovely visuals. So much so, that I wished that if Gunn wasn't going to go eclectic with his song choices, then why not just fully embrace the hazy, pastoral, stoned 1970's AM radio vibe (the Cat Stevens' song was a nice touch) more openly rather than pretend he has some kind of rock and roll space odyssey, which this film is not, regardless of what it tries to express to the audience. The uninspired quality of "Guardians Of The Galaxy Vol. 2" extends more seriously towards its own actors and characters. Chris Pratt, an actor whom I like and certainly does possess his charms, but with the first film as well as Colin Trevorrow's awful "Jurassic World" (2015) he is quickly becoming a one-trick-pony (not necessarily his fault) by being the glib hunk and not really having anything else to do and no real notes to play other than being glib. Zoe Saldana is essentially in the same boat and their overall blandness doesn't rally make the characters and potential romance of Peter Quill and Gamora anything to root for or become invested in. Frankly, when Baby Groot carries more personality than your living, breathing leading actors, you have a serious problem here. One criticism I had about the first film was that it completely felt as if Gunn and the shareholders at Disney (which owns Marvel), simply wanted to try and essentially re-make George Lucas' "Star Wars" (1977) but one in which every single character was basically a variation of Han Solo. With "Guardians Of The Galaxy Vol. 2," it is clear that Gunn wanted this episode to serve as his version of Lucas and Director Irvin Kershner's "The Empire Strikes Back (1980), as Gunn has separated his main cast of characters from each other for the bulk of the film and has then layered the story with several themes of family, lineage and the sense of loyalty that is inherent. In this area of the film, Gunn has certainly given himself more than enough to chew on concerning the Father/son relationships between Peter Quill, Ego and Yordu, the sister relationship between Gamora and Nebula, as well as a certain Father/brother bond between Yordu and higher ranking Ravager, Stakar Ogord (Sylvester Stallone in a role that is definitely setting up future films) and then the complete family dynamics contained within the Guardians themselves. Now here is where I did appreciate some of the considerable extra effort on Gunn's part to expand his particular universe and there are some good moments scattered through the film that attempt to delve into something deeper. But for me, even with all of the psychedelic whiz-bang happening all around, ultimately, I was bored. Yes, dear readers, James Gunn's "Guardians Of The Galaxy Vol. 2," even with all of my criticisms is not a bad film. Just a profoundly un-involving and somewhat impersonal one and it did indeed leave me bored for much of its hefty two hour and fifteen minute running time. I know that again I am in the minority on this one and the series overall but as it stands, I cannot help but to think what this series may have been like in the hands of another and more inventive, audacious director like Edgar Wright. Now THAT would have been something to make this series wave its freak flag sky high! 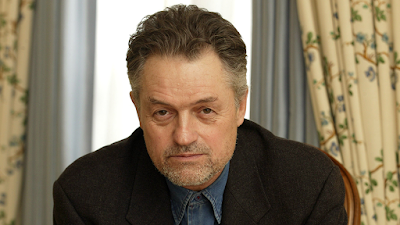 I cannot express to you enough of the level of surprise I felt when I opened up my e-mail and saw a report from Variety that filmmaker Jonathan Demme had passed away from complications due to esophageal cancer and heart disease. He was 73 years old. Aside from not ever really knowing that he had been so severely ill, I was actually more surprised by his age as he was a filmmaker that seemed to be so youthfully restless, as his life's work consisted of narrative feature films, documentaries, television work and music videos all culminating with his final film, the concert documentary "Justin Timberlake + The Tennessee Kids" (2016), plus one episode on the FOX television series "Shots Fired." 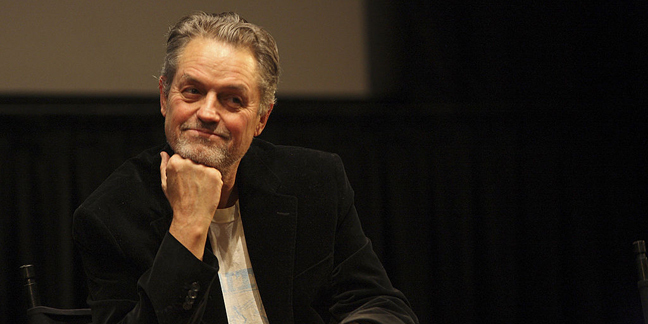 The filmmaking legacy of Jonathan Demme is of such vastness that it would be impossible for me to speak of it at length as I have not actually seen so much of it, and to that, it is indeed my loss. But, what I can express to you is again that seemingly youthful restlessness that spoke to me. That seemingly endless curiosity that informed his work, creating an image in my mind of this bemused seeker armed only with a camera traveling around pointing his instrument at any and everything that fascinated him. Demme's complete ouvre was a showcase for that explicit fascination, which he documented and presented completely without judgement, and possibly only with the agenda to allow us to see the world through new eyes, therefore giving us a larger understanding of our shared humanity. It is imperative that I pay my respects at this time for this uniquely idiosyncratic filmmaker, a figure who, time and again, expanded and exploded any pre-conceived notions of what I thought the movies could and could not be. How much weaker my cinematic education would have been if I had never seen even one of his films. I first came upon this film at the age of 11, the year it was originally released, via the rave reviews given by the late, great Gene Siskel and Roger Ebert, both in print inside of the Chicago Tribune and Chicago Sun Times, respectively as well as their television movie review program, which I think was still airing upon PBS at the time. 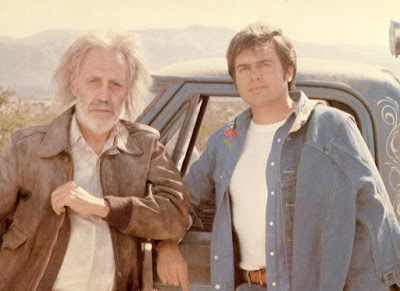 It is because of Siskel and Ebert that I saw so many different kinds of films that I otherwise never would have seen as I valued their opinions and teachings so powerfully and Jonathan Demme's "Melvin And Howard" was no exception. I eventually saw the film for the very first time about a year after its theatrical release when the film began its cycle upon a Chicago pay TV channel called ON TV. Admittedly, I wasn't entirely sure what to make of the film after that first viewing. But, somehow, this story, set in the early 1970's about a down-on-his-luck Nevada milkman (played by the wonderful Paul Le Mat) who kindly picks up a disheveled, bearded elderly gentleman who turns out to be the eccentric billionaire Howard Hughes (played by Jason Robards) captured and most importantly, held my attention for its duration. Within this film, Demme gave me a peek into an environment that was world away from my middle class Chicago life. It was a world filled with characters and personalities that I really had never seen before or would have even given a chance if not for Siskel and Ebert. But, it was Jonathan Demme's skill as a storyteller and cinematic world-builder that kept me watching and even returning, as I gladly re-watched the film as much as six or seven more times during its pay TV cycle. While I have not seen this film for perhaps over 30 years, there are sequences and moments that I am still able to recall instantly. Actually, even writing this little about it now, I am inspired to try and track down the film and see it again through the vantage point of my adult eyes and broader worldview. The concert film against which most concert films have been compared with and rightfully so. Demme's "Stop Making Sense'" is undisputed in its assessment as being one of the finest and most unique concert films ever made, and this is from a filmmaker who also directed "Storefront Hitchcock" (1988) starring Robyn Hitchcock as well as the Neil Young trilogy consisting of "Neil Young: Heart Of Gold" (2006), "Neil Young Trunk Show" (2009) and "Neil Young: Journeys" (2011). 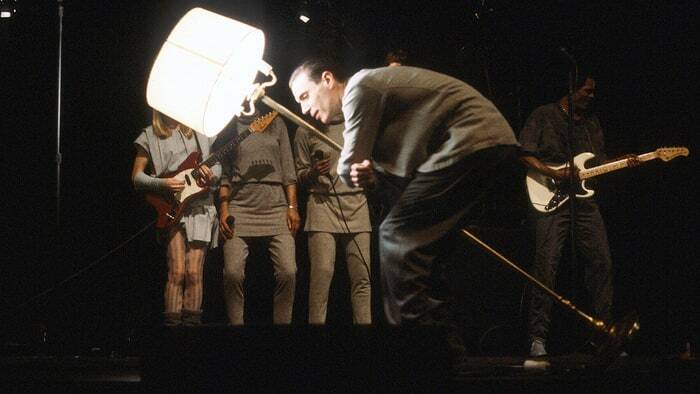 But, "Stop Making Sense" is a true cinematic and musical treasure, elegantly filmed and presented with such joyous abandon and inventiveness which makes it ripe for watching over and again. Demme was the perfect directorial match for a band as unorthodox and idiosyncratic as Talking Heads as he created a fully unorthodox and idiosyncratic format in which to present them and their music. By eschewing with shots of the audience having a great time, "Stop Making Sense" focuses solely upon the story of the band as they enter the stage one by one until the core foursome plus their auxiliary members explore their timeless and innovative polyrhythms, melodics and lyrics with a boundless childlike enthusiasm that was a wonderment to regard. Bandleader David Byrne in particular made for a defiantly unique screen presence as well as musician as his anxious antics and sheer athleticism made him compulsively watchable, leading to the iconic imagery of the "Big Suit." Just unforgettable!! No wonder the band never toured again after mounting the stage s how from which this was filmed. And therefore, no wonder has there never again been a concert film like this one. One of the best films of the 1980's...period. Again, introduced to me through the notable enthusiasm of Siskel and Ebert and even further compounded, and audaciously so by a terrific Math teacher who was so overcome by the film that she could not even begin the morning's class session before extolling her excitement over having seen it over the previous weekend. Jonathan Demme's romantic comedy/thriller hybrid more than lived up to its title as the road odyssey, featuring a straight-laced "closet rebel" (played by Jeff Daniels) taken for the ride of his life by the openly rebellious free spirit Audrey a.k.a. 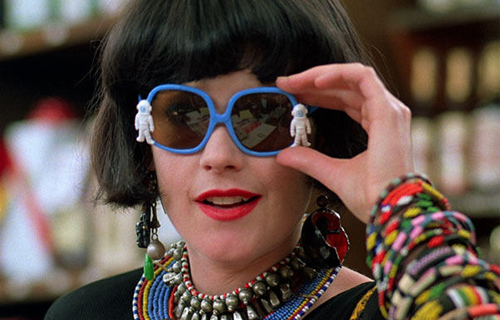 "Lulu" (Melanie Griffith in her best performance to date) and who are both being menaced and pursued by a terrifying criminal named Ray Sinclair (a fantastic Ray Liotta), exuberantly blew apart storytelling cliches and conventions to became a completely unpredictable and equally unforgettable movie. Demme presented this fearlessly irreverent vision through an explosion of colors, relentless energy, striking humor, bold sexuality, truly surprising violence, and a huge heart while entirely set to the an astonishing multi-layered, multi-cultural soundtrack (of no less than 49 songs) that superbly boasted Demme's impeccable musical tastes. In many ways, as with "Stop Making Sense," the only filmmaker with whom I could compare Demme with in the instances of these two films would be Martin Scorsese, whose concert film "The Last Waltz" (1978) and his own audacious, wild night experience with the brilliant "After Hours" (1985). Great company to sit with indeed and much for Scorsese as it was for Demme. Quite possibly Jonathan Demme's most impassioned slice of humanity could be found within his legal drama that gave homosexuality, homophobia, HIV and AIDS the precise dose of empathy and artistry to make a seismic impact within the mainstream movie-going audience. 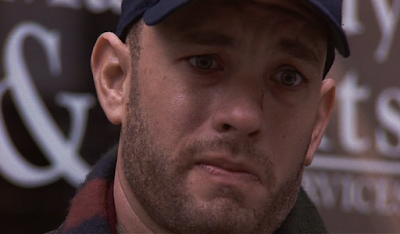 The casting of Tom Hanks, one of our favorite Hollywood "everymen," as an attorney who happens to be a closeted homosexual and AIDS patient who is unjustly fired by his law firm was a masterstroke, just as much as the casting of Denzel Washington as the homophobic attorney who gradually decides to take up the discrimination case of Hanks' character. I am expressing this view because who within our mainstream movie-going audience would wish to watch Tom Hanks dying over the course of two hours? Our empathy is already built into our shared love of this particular actor and the screen persona that he has conveyed throughout the entirety of his career. With regards to Denzel Washington, Jonathan Demme was much more shrewd by having this African-American male work as the stand-in for the presumably predominant Caucasian mainstream movie-going audience, through which Washington's evolution would mirror. But "Philadelphia" succeeds as far more than something akin to brilliant "stunt casting," as Demme is fully concerned with showcasing precisely the elements that make up our shared humanity from careers, families, hopes, fears, desires, and most profoundly, our shared mortality. Because in the end, we are all headed to the same conclusion regardless of our sexual orientations and preferences, so what kind of a society would we be if we denied anyone the ability to live to the fullest of their particular truth? Certainly, this is a life lesson that feels to be even more urgent in the 21st century, but in 1993, mainstream movie going audiences needed a push with this deeply affecting, beautifully acted film that worked as a movie that carried a message rather than a demonstrative and hollow "message movie." For me, this film stood directly alongside Steven Spielberg's "Saving Private Ryan" as two of the finest films 1998 had to offer, yet audiences didn't warm to this passionate, poetically political film whatsoever, which is a tremendous shame due to the shattering beauty of its uncompromising power. Yes, the film's leading actress Oprah Winfrey's pilgrimage to bring the iconic Toni Morrison novel to the screen is more than worth any accolades the film ever received and quite brilliantly, her choice to handpick Jonathan Demme could not have been any more perfect as his cinematic and humanitarian sensibilities completely captured the interpersonal and supernatural drama of Morrison's source material. 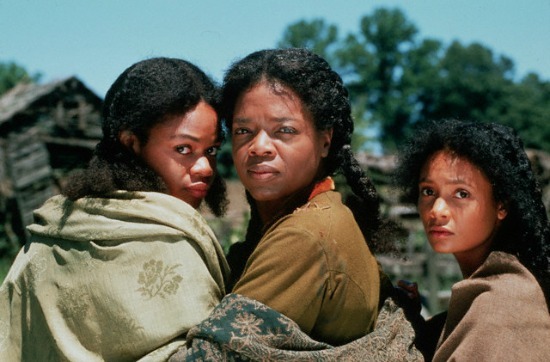 But, what struck me the most about "Beloved" was that Demme fully fashioned a film about our country's Reconstruction period--the nation, certainly, as the film is set after the end of the Civil War. But, primarily as a story about the reconstruction of the African-American race and how we began our attempts with rebuilding ourselves after surviving the nightmare of slavery, a system that was designed to annihilate us. This is indeed a most difficult film and rightfully so. But, if you have not seen the film, trust me, dear readers, as I would never steer you wrong. The rewards of "Beloved" are enormous as Jonathan Demme guides us through nothing less than an existential journey from holocaust to horror to healing. One of the very best films of the early aughts and Jonathan Demme's last, truly stunning and sharply delivered narrative feature. Serving as a brilliantly perceptive and poignant study of a family travelling through a whirlwind of joyous uplift as well as emotional minefields when Kym (an outstanding Anne Hathaway) returns home in her first week out of drug rehab to attend the weekend wedding ceremony of her sister Rachel (played by Rosemarie DeWitt), "Rachel Getting Married" superbly avoided all of the cliches and trappings that are typically found within the cinematic wastelands of self-consciously quirky "dysfunctional families" that never, ever ring true. By contrast, Demme presents a family with the perfect amount of realism, frailty, fragility, nuance, texture, fury and overarching love that would be present within anyone's extended families. 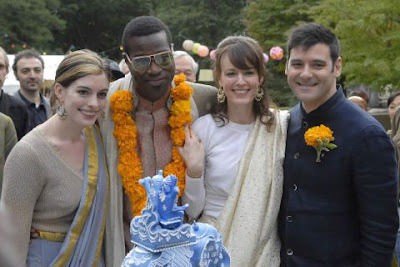 Furthermore, Demme's presentation of this particular extended family, growing even larger with the notably inter-racial marriage of Rachel and Sidney (played by Tunde Adebimpe from the band TV On The Radio) , who is African-American, gave us a view of the changing face of the American landscape precisely at the moment the United States of America was about to elect its first African-American President. No, this aspect of the film was not through any sense of faux political correctness. Demme gave the audience a healthy dose of a social/political reality in regards to how diverse our country's population and the families within have all become. Filled and even over-flowing with an immense joy of life, music, love and family, Jonathan Demme's "Rachel Getting Married" represented this idiosyncratic filmmaker at his finest. Those six films are the ones that I feel closest to, yet for yourselves, you just may come up with a completely different list if asked, such is the variety of Jonathan Demme's extensive filmography. As I think of him now and as I regard the full list of films that he has made--many of which I haven't even seen---it is downright remarkable to find a filmmaker so willing to extend his curiosity to seemingly wherever it carried him. From his romantic comedies, psychological thrillers, documentaries that contain subjects as varied as President Jimmy Carter to even Demme's own Minister cousin and even more, I think what we have gathered most of all is one filmmaker's full vision and exploration of the world in which he lived, what that world meant to him, and the unabashed glee with which he created his films that carried those messages to the world. Humanity. Possibly the theme I have returned to the very most throughout the longevity of this blogsite. Humanity is the defining characteristic that I am able to find when looking at Jonathan Demme's filmography. Who knows? Perhaps if we took a look at the world through his cinematic eyes, our viewpoint could potentially be expanded, possibly leading to a greater understanding of our shared existence. That is the greatest gift a filmmaker can have, I would think. And to celebrate, treasure and cherish the gifts he has left behind for all of us, it is to our duty and entertainment to accept what he so joyously offered. KNOWING IS GOOD. KNOWING EVERYTHING IS BETTER: a review of "The Circle"
With as much as I am fascinated by and attracted to all manner of technology,those nifty adult toys with the requisite bells and whistles that keep us all addicted to being tuned in, turned on and endlessly wired and connected, I also deeply value my time away from it. Nowadays, while ensconced in the aggressively hardwired 21st century, I probably value it even more than I ever thought that I would. While I definitely see the advantages of a GPS system, I do not have one in my car. While I do see the advantages of owning a smartphone, I also do not own one and truth be told, it really took some arm twisting to convince me to purchase a cellphone in the first place many years ago as I was so resistant to it. I do not own a flat screen HD television. My social media excursions are limited to Facebook as I am not on Twitter, Snapchat or really much of anything else at all. I don't sleep with my cellphone near me and the laptop I own is usually sitting comfortably within its case in my living room as I primarily use the desktop, just as I am doing as I write to you now. For me, I am old enough to vividly remember life and existence without any of these items and as I journey through my daily travels seeing individuals truly locked to their phones, people walking down the street almost hypnotically looking downwards into the palms of their hands rather than remotely upwards into life itself, I am reminded that I am not missing anything by not having so many of these gadgets and items that simultaneously connect and disconnect us from our own existence. No, I am not trying to claim some sense of superiority as I have my own ways of disengaging, most notably through my own headphones and the music I blast into my ears as I walk around, and of course through Facebook and yes, these blogsites upon which I write. But, I do think there is something to be said when I walk into any of Madison's many coffeehouses and witness people staring into screens and not engaging themselves in the art of conversation with each other face to face. And I also cannot help but to wonder about the generations of people who have only known existence with being plugged in. To them, what does privacy, surveillance or even internal silence mean, if anything at all? This specific quandary sits at the core of "The Circle," Director James Ponsoldt's adaptation of the Dave Eggers novel. While some may wish for more of a traditional corporate, technological thriller with easy to spot heroes and villains, I think what Ponsoldt has achieved is a film that is more meditative, cerebral as well as more than a little creepy regarding our relationship not only to technology but to our own sense of interpersonal detachment and increasingly Orwellian existence, which we all seem to be only too happy to subscribe to. It is this more thoughtful approach that ultimately made for a quietly disturbing film. "The Circle" stars Emma Watson as Mae Holland, a young college graduate stuck in a low paying dead end cubicle job, who worries over the status of her parents, including the debilitating health of her MS afflicted Dad Vinnie (well played by the late Bill Paxton) and still carries a tentative relationship with her ex-boyfriend Mercer (Eller Coltrane). Via the influence of a college friend named Annie (Karen Gillan), Mae scores an interview, and ultimately a customer service position, at The Circle, a massive technological and internet/social media corporation, a campus that houses a compound and working population that would easily function as its own city (for those of you in Madison, think Epic Systems). 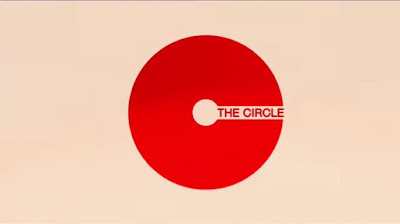 The Circle is owned and operated by the seemingly congenial Eamon Bailey (Tom Hanks), whose easy going, "aw shucks" charm combined with his technological visionary status has made him the greatest of rock stars to his staff, or perhaps, as Mae quickly questions, is he some sort of a neo-cult leader to his legion of disciples, as one of his personal mottoes happens to be, "Knowing is good. Knowing everything is better." Soon, Mae captures the attention of Eamon and she begins to rapidly rise through the ranks of The Circle, eventually becoming the central figure in a revolutionary new technological advancement that fully blurs the ethical lines and boundaries between privacy and public knowledge which then further complicates concepts of personal freedom and virtual imprisonment. And in doing so, Mae's participation not only threatens her relationships with her family and friends, but the overall fabric of our sense of humanity. On the surface, James Ponsoldt's "The Circle" may feel to be a bit of a hybrid between films like David Fincher's "The Social Network" (2010) and Sydney Pollack's "The Firm" (1993) or at least an experience that sits somewhere in the same virtual neighborhood as USA Network's "Mr. Robot." While Ponsoldt's film is not in quite the same league as those comparisons, it is indeed a smart, savvy and more than insidious little thriller that uncomfortably forces its audience to take a hard look into the mirror at our own societal complacency concerning our own increasing levels of oversharing, permissive lack of privacy combined with our collective insatiable need to have our individual voices heard regardless of either the real or virtual world. As I continue to ruminate over the film, two sequences/sections of the film come to mind powerfully in regards to the character of Mae Holland and how she serves as a reflection of each and everyone of us in the audience. The first sequence arrives during a course in the film where Mae's skepticism and quiet challenges to the authoritarian system of The Circle come into question as she is essentially coerced by Eamon and his right hand man Tom Stenton (played by Patton Oswalt) to become the test case in a program involving complete transparency, as they reason that people would behave as their best selves if they were under constant surveillance, therefore leaving every piece of themselves open for public view and ultimate scrutiny. Seeing as she has now not only made a comfortable living with the organization and the fact that her parents, especially her Father's health care needs, are being more than cared for financially, Mae feels obligated to acquiesce. What follows are sequences where we witness every moment of Mae's life, save for an allotted three minutes of private time for a bathroom break, being broadcast to the world--kind of like an updated version of what we saw in Peter Weir's "The Truman Show" (1998)--yet, what is different is how the public at large is able to comment upon her every movement, decision and seemingly, her every thought in real time. Ponsoldt visualizes this aspect of the film by loading the screen with the variety of social media commentaries delivered by Mae's viewers and the result is disturbingly overwhelming. What's more is how after a spell, I feel that we are being asked to question just how much Mae is actually enjoying the increased attention, therefore fueling her sense of self-importance, narcissism and perhaps to an extent, whatever sense of entitlement she may be harboring in the process, calling to further question if The Circle is using her or if she is using The Circle. Another sequence features a boardroom section where Mae arrives at a new technological idea or advancement for The Circle that could align their social media services along with the United States government in a fashion where society itself would be beholden not to a nation of laws but to essentially an internet provider service. Without inadvertently delving into spoiler territory, in the film's final moments, where Mae's ultimate confrontation with Eamon comes to a head, I would not be surprised if some audience members exit the film confused or even disappointed as "The Circle" does not lead towards a comfortable, tidy conclusion. Quite the contrary, what we are left with is an ending that is philosophically and morally ambiguous yet completely fitting with the questions Ponsoldt is asking of us regarding our relationship with the technology that we are in no hurry to detach ourselves from. To an even greater extent, I feel that James Ponsoldt's "The Circle" is even pondering just what does it take to achieve the so-called "American Dream" in the 21st century. How much of ourselves are we willing to compromise or even discard in order to attain a certain level of power and control. Yet, if we did relinquish the best of ourselves in the process, are we truly in control of ourselves or have we simply given ourselves over to whatever larger forces to which we are attracted? These very questions make the character of Mae Holland and the film overall extend itself from existing as a simple computer thriller and more as a mediation about the paradoxes of our society. Is there freedom and liberation in constant surveillance? Can alienation be subverted by detaching ourselves from having any private moments? Are our thoughts still interior if we share all of them on a public forum? If our lives are lived on-line, then are we living at all? James Ponsoldt's "The Circle" is not a film for which we can have those questions answered, and frankly, how could it? But, it was in the asking, the provocation of the questioning that ensured this film would be a notable document of how life is being lived in 2017. So much for those plans and schemes, huh? At any rate, more notable films are set for release in May, essentially the beginning of the Summer Movie Season, and here's hoping that it will be a more impressive one than the one delivered just last year. 1. May will open with that proverbial bang as Writer/Director James Gunn unveils "Guardians Of The Galaxy Vol. 2," his long-awaited sequel to the beloved 2014 original--a film that found me far in the minority as I was considerably underwhelmed. Yet, I am curious about this second installment, partially because of how the film will extend the overall Marvel Comics Cinematic Universe plus the fact that now that Gunn has his origin details out of the way, let's see what's next. Maybe I'll be surprised this time? 2. Writer/Director James Ponsoldt's new thriller "The Circle," starring Emma Watson and Tom Hanks, was just released this past weekend and apparently, the box office was not strong. So, if I'm going to check out this one, I had better act fast! 3. Ridley Scott makes another return to his interstellar horror franchise with "Alien: Covenant," the follow-up to "Prometheus" (2012), a film I am now wondering if I was the only person who really liked it for its gonzo energy, despite some bone-headed lapses in logic for a team of scientists. Let's see if I can be more productive this month, shall we? Please wish me good luck and good health and I'll see you when the house lights go down!!! !